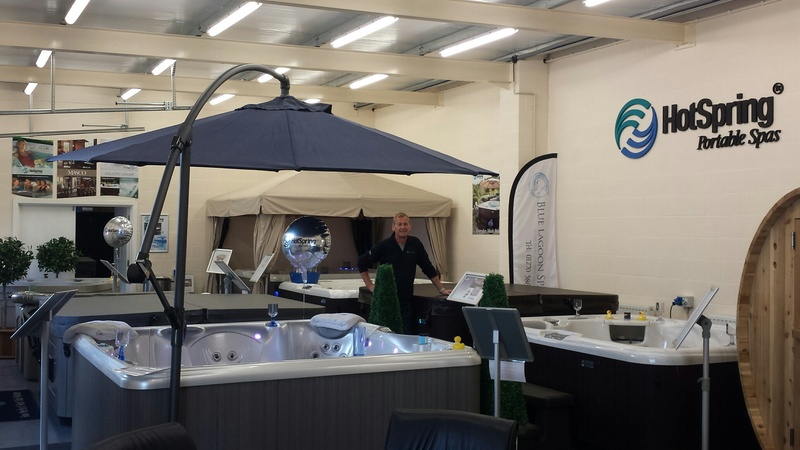 HotSpring dealer Paul Buckley at Blue Lagoon Spas has achieved record-breaking sales results every quarter this year in a new showroom location in Crewe during his company’s tenth anniversary celebrations. Ahead of the 2014 season, Paul, pictured, relocated the dedicated HotSpring dealership to the Macon Business Park near the A532, and the move has coincided with his best ever year of trading and the introduction of the latest NXT models in the USA-brands Highlife collection from Watkins Manufacturing, to sit alongside the Hot Spot and Limelight range of pedigree models. The manufacturer has achieved increased sales success for its UK retailer network this year, including a record-breaking performance in November, following the introduction of three Highlife NXT designs including the best-selling 2014 WhatSpa? Best Buy Award-winning five-seater Envoy NXT, which comes in at 236 x 231 x 97cm with 43 jets. A seven-seater Grandee NXT, which comes in at 254 x 231 x 97cm and has 43 jets; and the three-seater Jetsetter NXT, which comes in at 213 x 165 x 84cm and has 22 jets; have also created the ‘wow factor’ this year in HotSpring showrooms. The trio of models have the award-winning ACE Salt Water Sanitising System as standard, while owners also have the option to combine the NXT designs with the EverFresh System. Other 2014 WhatSpa? Best Buy Award-winners include the four-seater HotSpring Limelight Bolt, coming in at 203 x 203 x 84cm; and the four-seater HotSpring Highlife Triumph, coming in at 236 x 188 x 84cm. The Triumph is a new stablemate to the 2013 WhatSpa? Best Buy Award-winning six-seater HotSpring Vanguard, coming in at 220 x 220 x 91cm; which was featured on an episode of ITV programme ‘Love Your Garden’ presented by Alan Titchmarsh, after being donated by HotSpring World for the installation that was screened in the summer. As well as providing a hot tub hire service, which is fully booked up for Christmas and the New Year festive period, Paul also supplies Riptide swim spas, including the 2014 WhatSwimSpa? Best Buy Award-winning Nautilus Super Pro, as well as barrel saunas and spa gazebos. Over 30 highly-prized Google testimonials have been achieved thanks to the satisfaction gained by owners of the wide range of Blue Lagoon Spas pedigree products and the top level of customer service provided by Paul and his hard-working team. “Last year was good and this year has been even better, following our move to new premises, with record results in every quarter,” reported Paul; “So long may it continue. “Our current quarter is also another record-breaker compared to past years and we could also be doing the same in our next and last quarter for our best ever financial year. “For many years now we’ve been building up testimonials from satisfied customers, 31 of which are the highly-prized Google ones, and that will take a lot of catching up. Filed Under: Economy news, News, News & views, Retailer interviews, Sales & marketing Tagged With: Blue Lagoon Spas, HotSpring, Watkins Manufacturing, WhatSpa?